These look very nice. Did you use 8 bobbins? I started with the beginner's braid using only 4 so I am impressed! I also use embroidery floss, as it has a range of colors and has a sheen not unlike the traditional Japanese biron. The DMC cotton works well, although it is more matte. Some colors are available on larger spools, making it economical. I do recognize that some people don't approve of the embroidery floss or cotton, however. I generally use a woven silk that is yarn-like. It is sold for weaving. Some is a silk-wool blend, which also works nicely. I like the softness of the silk. I buy it at a weaving shop. It is sold by the ounce; it comes on large spools and you wind off as much as you like. I keep alot of the black and white on hand, and the minimum amount required for purchase is quite alot but not very expensive. I do try to stick to one type of thread for a braid - e.g. not mix cotton and silk, unless I am mixing something in for special effect (e.g. 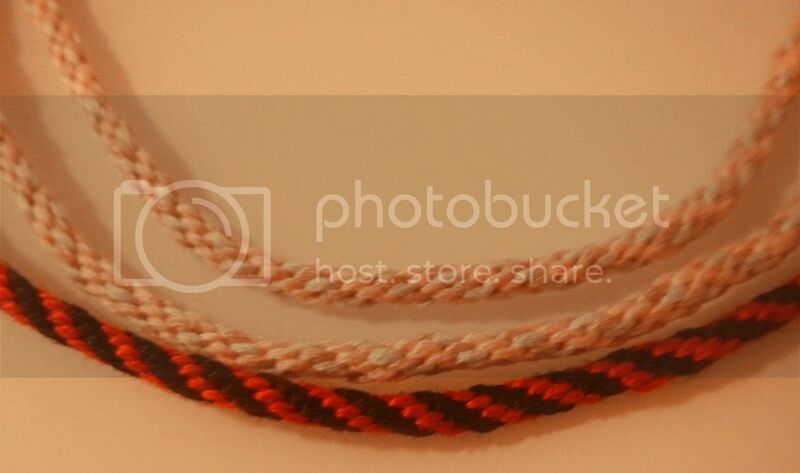 shiny colored floss to offset neutral silk as a background. I do like to take Lithicbeads with me to the store, stone in hand, to pick out colors. Wow, you did great on those! Kudos.